In 2012 I was given the gift of a lifetime. I traveled to Europe with Kelly, Corey and Chris. Kelly and I flew to Germany and met up with Chris who was in Switzerland for work. 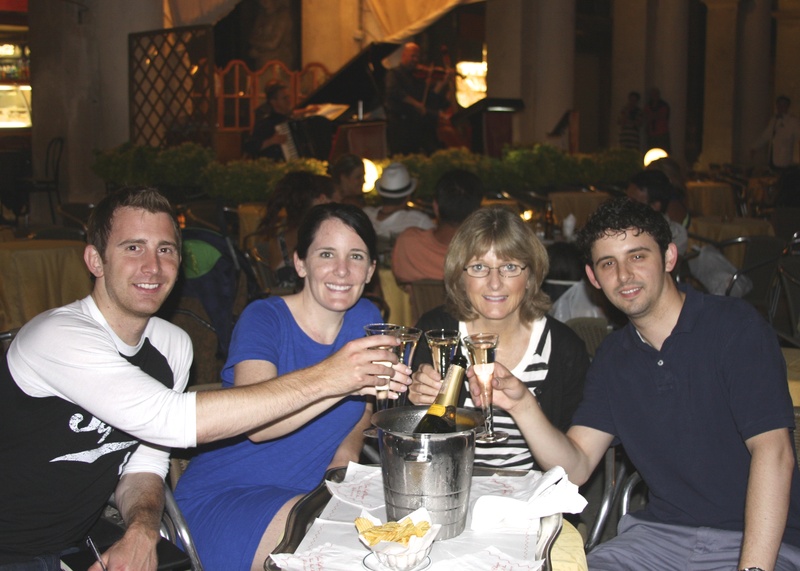 Then we all took a train to Venice where Corey met up with us one night while we were drinking Prosecco in Piazza San Marco. After Venice we went to Florence, then to Rome and finally to Capri. While we were in Rome we visited many beautiful religious sites, including the Vatican and the Sistine Chapel. One evening we took a taxi to the Colosseum where we got into an argument about religion while we were admiring and learning about the history of the moonlit structure. To make a long story short, the conversation revealed some differences in opinion and ended with some hurt feelings. The next day things were still a little sensitive and Corey and Kelly weren’t happy with one another which made me upset because here we were on this beautiful vacation and my kids were fighting. The trip ended well with a few days spent swimming and shopping in Capri and we all went back home, Kelly and Chris to Chicago, Corey to San Francisco and me to Muskegon, but Kelly and Corey were still sore at each other. I have thought a lot about that night at the Colosseum. Differing opinions are a natural part of life and fortunately Kelly and Corey have been able to resolve their differences and forgive each other. I wish everyone could. Forgiveness is one of the hardest things to do in life, but also one of the most rewarding. So glad they made up. Rosemary, no truer words have been spoken. Forgiveness is key to healing any broken relationship. Thank you for sharing, Rosemary! A beautiful reminder of what is prayed in The Lord’s Prayer!! Forgiving others is important, and often very difficult! I wish everyone could too Rosemary….